This would be awesome in a southwest style kitchen. This nice howling coyote cookie jar is made of heavy pottery, hand painted, and has a soft sheen glaze. 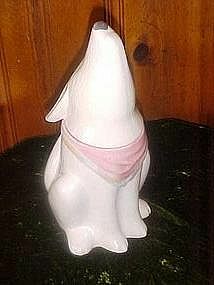 It measures 14 1/2" tall and wears a kerchief of soft pink and blue. Perfect condition and no chips or cracks. No makers marks. A great cookie jar.